One of the most interesting aspects of El Ministerio del Tiempo is how it allows us to learn more about well-known figures. We know the names, their main works, but this show teaches us about their lives. Okay, ‘Time of Spells’ might have been more about witches and cult villages, but we did get a glimpse at an important time in the life of Gustavo Adolfo Bécquer. 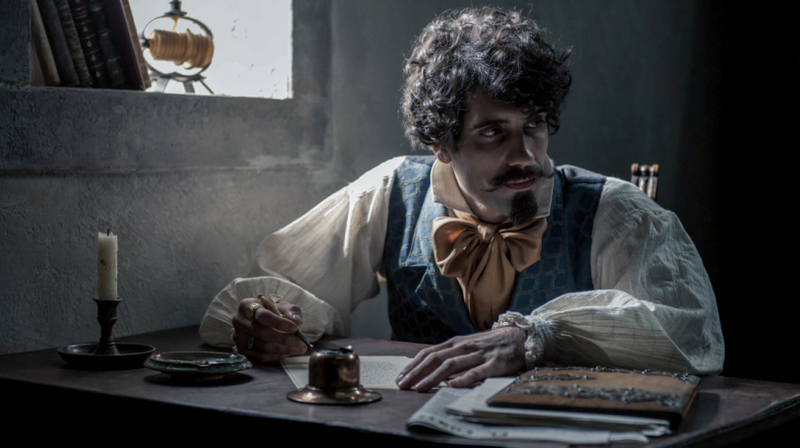 The team has to travel to 1864 because Bécquer has written a tenth letter from his Cartas Desde mi Celda collection, which Salvador finds odd because the poet only wrote nine. Does it really matter? Pacino asks. Well, the letter is about this woman called Mencía that appears to be a witch, a woman of whom they’ve found portraits from different moments in history. So yes, this witch has clearly found herself some doors, so the team has to make sure she doesn’t meddle with Bécquer’s life. At the monastery of Veruela, Pacino -who is suffering from, let’s say this nicely, indigestion- quickly befriends Bécquer, but Alonso and Amelia start acting weird, spending too much time with the villagers of the neighbouring Trasmoz, who want to kill Mencía and are clearly deranged. After Mencía informs Juana, a pregnant girl from Trasmoz, that she is having a son, Juana freaks out for reasons unknown to us viewers. It is only after she gives birth that things make sense: Mencía sneaks into the house at night and steals the baby, and while Pacino wants to investigate this further, Alonso and Amelia decide to go into the woods with the Trasmoz people to find Mencía and kill her. Things only get weirder from this moment on. Pacino visits Juana and finds she’s been beaten to death. When he and Bécquer go to the woods to find Mencía, they stumble upon a satanic ritual where the Trasmoz people (plus Amelia and Alonso) are about to sacrifice Mencía and the baby. Luckily, the two men free Mencía before anyone can see them, and run away -Bécquer returns to the monastery, where he’ll pretend the baby is his so he doesn’t get killed, and Pacino and Mencía keep running away. But Mencía has had enough. She confronts the villagers at the edge of a cliff (of course) and admits she is tired of always running away from Inquisitions. She jumps to her death, although you can see that this is what finally brings her peace, and Pacino is now the object of the villagers’ sacrifice. But he makes it to the door on time. And Alonso and Amelia are brought back after getting knocked out and taken to hospital so all the mandrake in their system is pumped out. Oh, and in the meantime, Irene has been forced to train Young Lola, something she is hesitant to do at first, but she eventually acknowledges that she is a great asset. Angustias is not so happy about it. -Bécquer went to the monastery to cure his illness, but he eventually died of tuberculosis, because of course a 19th century romantic poet died of tuberculosis. -Loved Amelia’s monologue about her confusion regarding romantic comedies, because she expected them to be like 19th century Romanticism. Like Pacino says, she’d better watch horror films then. -You have to love Angustias and the way she violently closes a file in front of Young Lola. -Pacino, like the pop culture lover he is, talks to Bécquer about the shipwreck he is supposed to have been in, and of course he is telling him the story of the Titanic. -“We should inform the team. By the way, have we heard from them?” “No, but whenever you say that, they call.” Unlike last time, the team didn’t call straightaway after that comment.